Places to stay in Key West, Florida. 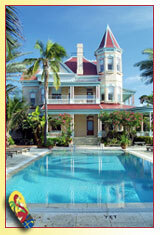 ccommodations in Key West are plentiful and run the scale from top end to economy. There are large and small hotels and motels, inns and guesthouses. The best thing to do is think about what you want from your vacation and how best to accomplish that, with consideration for who will be accompanying you. All amenities; pool and or beach, resort facilities, restaurants. Traditional Conch Houses offering comfortable, casual lodging. A property management company has a vast assortment of condos, houses and estates from which you can choose.